I live in a pretty well to do town. There is definitely a carpool/soccer Mom look. The Moms' look fashionable, fit and appropriate in their Bermuda shorts and cute summer tops. Then again Kate surely doesn't do carpools or soccer games! Kate went to the grocery store, the UPS store and Dicks, in high heels....not to mention her outfit is not even a cute one. Jon, I don't care how slowly you are going on your ATV...these machines are not built for children. The helmet is entirely too big, and most likely would slip off if a fall occurred. Not to mention Kate will use this against you as endangering her kids. I kind of feel bad how stupid he is really is. Just wanting to know what others are thinking about the new blog? Who do you think is behind it? Do you think Julie is Serena? Do you think GWOP is bogus? I really don't mean any disrespect to the other blog owner....hey, it's a free country. So please don't anyone get their unnawares in a wad! If there are lies or untruths to be uncovered I am all for that. Comments, thoughts, opinions....now swearing or vulgarity, please. "I am the FIRST person to say I do want to see the show come back. But I don't think anyone would want to see a separated couple trying to cope with getting a divorce. I am hoping that both Jon & Kate and TLC are taking the time to discuss how the show, in the format it is now, can continue to make US fans happy." This is sick to me on many levels. Obviously this family is a tragedy and Crazy wants US fans to be happy. Disturbing, to the core. After reading several different articles regarding Mady and Cara's reaction to the divorce I have asked myself why Kate felt it necessary to reveal the hurt and sadness that her daughters' felt when told this life altering news. Why was it necessary for her to reveal Cara's physical state, Mady's sense of no surprise? Of course we know Kate doesn't care about her kids privacy. But to go as far as to discuss their feelings about this has bothered me a great deal. Kate thinks about Kate first. I think these comments were meant to be hurtful to Jon. To put herself in a more pitiful position. To garner sympathy. Just when I think I have hit a plateau of disgust for these 2 buffoons, one or both of them sets their individual bar of jerkness a little bit higher. And sadly, I know they will surpass their personal bests with more to come. My heart goes out to these kids. 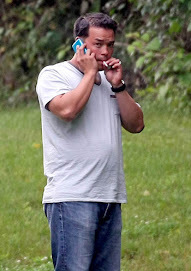 And in years to come, sooner than we probably expect I hope our hearts are open when the teenage Gosselin's begin to misstep. I read so many comments by so many different posters that they will never watch Jon and Kate again, but wait anxiously for a stupid recap. I have also seen comments made during the actual show wanting an update on what Kate is wearing, or something equally ridiculous. I read things like "I overheard the show from another room", or "I came across it while looking for another channel, but got caught up in watching it", only to degrade themselves for watching the exploitation of those "poor babies". I seriously do not understand the recaps people. Why the heck do you want a recap of a show you hate, about child exploitation. This is the most idiotic and ridiculous thing you weirdo haters participate in. We know you all watch the show. Jon is proud of himself. Kate has a new platform on which to continue speaking. Comments about Monday's big announcement can go here! There is a part of me that hopes that they go the route of counseling, non-TLC sponsored... stop the show and actually work on becoming better people, spouses and parents. I can dream right? Dude's tryin' to light up! 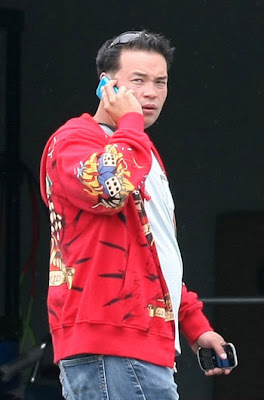 How Many Phones Does Jon Boy Need? 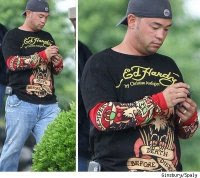 Jon Gosselin looking nouveau tacky in his Ed Hardy duds, must need a separate phone for making his drug deals and dates. Jon is going to crash and burn! YEA, I THINK THEY ARE DONE! Does Kate Have Any Boundaries? The pictures of Leah Gosselin being slapped by her mother will forever live on. My sorrow goes out to this little girl who has had yet another humiliating memory captured for all the world to see. I am sure this is not the first time a Gosselin kid has been smacked, hit, slapped, spanked or pinched, and most likely will not be the last. Do Jon or Kate have any boundary's when it comes to publicly humiliating their children? Neither Jon nor Kate exercise any good decision making when it comes to humiliating themselves, so it stands to reason that their children would grow up in a demeaning environment. 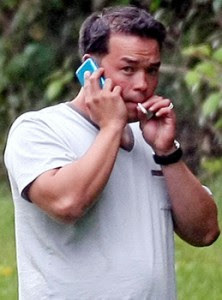 The Gosselin home has been photographed daily for at least two weeks straight with no end in sight. Why? Kate keeps feeding them exactly what they want! It would not surprise me if she hired her own damn photographer so she could make more money off her family! The fact is, we know she knows she is being photographed. Her children are having every moment stolen, whether they are working or at play. I find it disturbing that she is left to be the sole parent, when Jon is God knows where. Why is Jon not helping to parent these kids? I am also disturbed by the level of ignorance that Kate's fans possess. 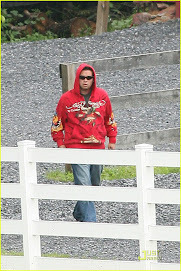 That people like Baby Mama and her followers think that Kate is innocent, a victim of the paparazzi. Baby Mama said…I agree 100% that the haters as well as the media are out to get this family any way they can. Bringing out something as personal as spanking a child, is horrific and unfair. They should be ashamed. She blames the "haters" and the media for drawing attention to this fame seeking, narcissistic woman! The redundancy in her next sentence stuns me. These children have nothing left that is personal. Watching them on television as entertainment is horrific! The fact that the kids earn the income for the family is unfair! A self-proclaimed "fan site" that has promised to not mention any negativity about the family provides you a link to the picture of Leah Gosselin's claim to fame! And for every other site that has created more ease and access to these photos, shame on all of you! "I would like to add that I do NOT feel that parents who hit their children are abusive parents. " Huh?!? I shook my head quite a bit today. I truly feel sorry for these 8 kids. And I am repulsed by anyone who still supports this woman. Monday night's show is sure to be a good one with the happy Gosselin family. Feel free to talk about the show here! Today is Jon & Kate's 10th Wedding Anniversary. I was going to mention this on a separate post. Since Jon wasn't with her on her birthday, I wonder whether they will spend their anniversary together. The new US Weekly today is saying her cheater on her on her birthday. its just so sad. I really hope that after spending this week apart, they will be together and perhaps heal on their anniversary. For themselves and the sake of their kids. I laugh at the spelling, the sentence structure and the whole idea. Jon and Kate are better apart than they are together, if you ask me. Seriously, I think Crazy drinks while she types! Kindof feel bad that she will probably be hit pretty hard, but maybe she wants some of the attention Jodi and Kevin have gotten. Now the point in me discussing this is to prove a point..Not EVERYTHING you read is true. And even when they say Susie Q saw Kate being nasty, you don't know if it's really true, only hearsay. And while I must stress again that US Weekly does NOT pay for interviews, they DO pay and DID pay Deanna's brother several thousand dollars for his video and for photos. That is fact. Take it for what it's worth. I can only imagine the fodder Crazy Mama gave this "reporter"...if in fact she really was contacted. Remember people, NOT EVERYTHING YOU READ IS TRUE! This woman becomes more ridiculous every day. If you leave anymore inflammatory comments, or if any other anonymous posters choose to, I will be publishing you IP address and location and filing a complaint with blogger. If you want to say something nasty, start your own blog. I thank you for for your civility and refrain from vulgar and profane words. Who Wrote Crazy Mama's RECAP? Checking in to see what Crazy is up to, I see a well-written recap with words like "perfunctory", "subdued" and "BAM"....even using quotations marks and commas! Come on, fess up, we all know you didn't write it! All in all, it was a pleasant show. Having Emeril at the G's house tempered Kate's meanness. The spotlight wasn't totally on her. Kid's having a good time, all the while being further exploited. Jon looked like an idiot peeling all the garlic. He really is a push over. Looks like Jon is being told what to do again! P.S. Jon, get back to working out. You are fat! Looks like the fab 5 has decided to move on to a new site. Can't say as I blame them. I don't really think they enjoyed the onslaught of new visitors who offered a dissenting view. We do now know that Guin's real name is Jennie, ahhhh, and she has a difficulty in self-control...who would have thought? Anyhoo....any thoughts on the future of this site? I am open to suggestions that don't involve the F word please! Oh wow...I never realized how truly ignorant some of Crazy's posters truly are. Between Leslie, Arabella, Shcmecky and Kelly the dumb knows no limits! I can't believe it. What happened about not mentioning GWOP or any negativity on your new and improved site? What was the point for starting a new one? Would someone let me know about the time frame here. I know her birthday is March 28th. Did Jon go on vacation for her birthday or was this because of the charity work he had to do up in Utah? You would think that he would want to be around for her birthday, but if it was for this charity I would understand…. OK, Crazy, here is the deal. Jon was in Park City during the week of March 23 to have fun with the locals for Spring Gruv. Basically a huge party with ski bunnies skiing and riding in their bikinis. This was the week that DeeDee met him for part of the fun! He was NOT in Park City to do any charity work. The half day he spent at the Ability Center was staged, a PR event (public relations) and that was the ONLY time he spent there. The rest of the time he was partying with Cooper, the Canyons snowboarder and his girlfriend. Why would Jon want to be with Kate on her birthday while in the midst of all their marital strife? Oh, that's right, you think everything is still A OK with the G family....forgot for a second who I was addressing.